A picture of the ‘Ex-Croall; McEwen’ Stradviari violin which appeared in The Times this weekend has unearthed some fascinating new information about the provenance of the instrument. The great-granddaughter of its previous owner, R.F. McEwen, informed us that it was bought for her grandmother, Katherine, when she was just eight years old. Katherine’s father, Robert Finnie McEwen, was a prominent Edinburgh lawyer but an inheritance enabled him to give up the law and pursue his first passion, music. His daughter’s early promise on the violin was surely what prompted McEwen to buy such a fine instrument for her from W.E. Hill & Sons. A prominent figure on the Edinburgh arts scene, ‘R.F.’ McEwen organised a series of free public concerts at the Nelson Halls, and Katherine appeared in two of these in 1912. It’s likely she would have made her debut performing in a duet with her father. The Nelson Hall concerts ended due to the war and Katherine married in 1922, supporting her husband in his demanding duties as the Governor of Bombay and Lord Chamberlain. He later became Earl of Scarbrough. Lady Katherine did not play in public again. Ingles & Hayday were contacted after a relatives of Countess Scarbrough saw a picture of the violin being played by Guildhall student, Samuel Staples in The Times. 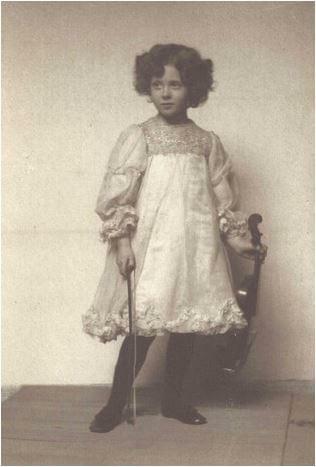 Portrait of Katherine McEwen (later Countess of Scarbrough) aged eight with a three-quarter size violin. Click here to read more about the ‘Ex-Croall; McEwen’ Stradivari violin which is due to be auctioned at Sotheby’s on Tuesday 28th March, 2017.